Absolutely Guttered Tel: 0203 553 1286 Gutter Repairs Essex – offers an expert gutter repair service in Chigwell, Wanstead, Hainault, Abridge, Ongar, Stapleford Abbotts, South Woodford, Buckhurst Hill, Epping, Barkingside, Loughton, Brentwood, Clayhall, Barkingside, Theydon Bois, Bethnal Green, Redbridge, Dagenham, Goodmayes, Seven Kings, Highams Park, Chingford, Essex & East London. All gutters are flushed and tested for leaks. All-Inclusive Quotes · Fully Trained Operatives · Fast Response · Highly Rated · Family Run Business – Competitive Gutter Repair Rates in Essex Also we take photos of before and after the works have been carried out as proof of work so satisfaction is guaranteed. 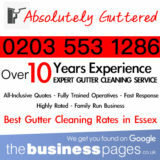 Absolutely Guttered Tel: 0203 553 1286 Gutter Cleaning Essex – offers an expert gutter cleaning service in Chigwell, Wanstead, Hainault, Abridge, Ongar, Stapleford Abbotts, South Woodford, Buckhurst Hill, Epping, Barkingside, Loughton, Brentwood, Clayhall, Barkingside, Theydon Bois, Bethnal Green, Redbridge, Dagenham, Goodmayes, Seven Kings, Highams Park, Chingford, Essex & East London. All gutters are flushed and tested for leaks. All-Inclusive Quotes · Fully Trained Operatives · Fast Response · Highly Rated · Family Run Business – Competitive Gutter Cleaning Rates in Essex Also we take photos of before and after the works have been carried out as proof of work so satisfaction is guaranteed.